A Shrine for worshipers to pray for the healing tumors, boils by Ohyakudo Mairi, ritual performance. Ishikiri-Tsurugiya Shrine, 「石切剣箭神社」,well known as Ishikiri-san, located in Osaka, at the foot of Mt. Ikoma is a very popular shrine to people since ancient times as the home of a deity who cures tumors and boils and any illnesses. As one of the worshiped objects here are swords, Ishikiri-maru and Kogitsune-maru. Those two swords are believed that are able to cut and penetrate any rocks. These two swords can be seen at festivals in spring and autumn. 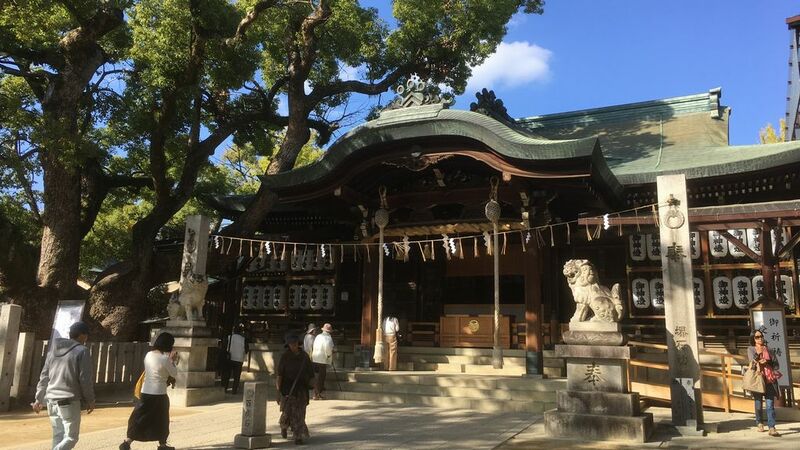 Today, Ishikiri-san attracts worshipers from all over the country who prays for healing. Your symptoms will be relieved if you walk one hundred times back and forth on the stone path between the entrance of the temple and the main sanctuary. This ritual performance of visiting and praying at the shrine a hundred times, called “Ohyakudo Mairi”, is particularly famous here. ● The main gate to the shrine. ● The water god, one of many small shrines in the precinct. There are many shops along the approach to the shrine from train stations. You can enjoy strolling and find souvenirs, Japanese sweets, or more at this old style shopping street. Access : 7-minute walk from Shin-Ishikiri station on the Kintetsu Higashi Osaka Line, or 15-minute walk from Ishikiri station on the Kintetsu Nara Line.